NEW: Benefit App – FREE Money! We realize there’s a lot to absorb, and you have a lot of questions. Below are some of the more commonly asked questions. Still need help? Reach out to any Band Boosters board member or ask Mr. Cowee. We’re all happy to help. The season begins with two weeks of Band Camp in August where students build up endurance, practice or learn marching techniques, and begin to practice the music for the marching show. The band performs the show at competitions during the season and at home football games. The season ends with finals in the end of November. Students attend after-school practices (Mondays, Tuesdays and Thursdays) and Saturdays to learn the music and movements for competitive performances. Any absences must be cleared in writing (email is preferred) through the Band Director prior to any event. How do we sign up for marching band / color guard? We will be holding a registration day for the 2019 - 2020 school year on May 18th in the band room. Please save the date and plan on attending. Registration forms will be posted a few weeks before then so you can get the paperwork out of the way. Check our home page in early May. What's the deal with band camp? It's super fun, that's what! The students have a blast while learning marching basics, drill, music, and parts of the upcoming show. Here's a short video from 2018 to help get you in the mood. Please disregard the dates as they are different from this year's band camp dates. This year's band camp starts right after school gets out. Note: times subject to change. Please check back with us as the dates get closer. Does my student have to do marching band? No, but a student must march in order to receive PE credit. Students who take a music course but do not march will not receive PE credits. How much does band cost? We rely entirely on the financial contributions and fundraising efforts of the band families. As a guideline, it costs our program approximately $400 to support each student. Can my student take 4 years of band and graduate or get into top universities? Yes. Below is a 4-year plan that allows a student to take band for 4 years as well as maintain the most rigorous academic schedule that TVHS has to offer. How much time is required for marching band? Marching band rehearses Mondays from 2:30-4 pm, Tuesdays and Thursdays from 2:30-6 pm and Saturdays from 9am-12 pm. The marching band performs at all home football games (usually 5 per season), as well as in competitions every Saturday in October and November. Will my student’s academics suffer due to such a large time commitment? Actually, the average GPA for our 9th graders in marching band was 3.42. Within that 9th grade class, 25% of our students earned a 4.0 during the marching season. In fact, 52% of our marching 9th graders earned a GPA of 3.5 or higher during marching season. The time commitment required for marching band actually helps students to learn to manage and prioritize their time outside of school. What happens at a competition? Marching competitions are held on Saturdays and generally last all day (approximately 8:00 am to 11:00 pm). Parents are welcome to volunteer to help before/during/after the competitions with uniforms, equipment loading and unloading, providing snacks and water for students, and riding the buses. Friends and family are welcome to attend competitions to watch our band and the other bands performing. There is usually an entry fee and sometimes a parking fee for attending. Students arrive at TVHS in the morning for warming up and loading the equipment onto the truck. The band has a semi-truck to transport uniforms and equipment to and from competitions. Students travel by school bus to all competitions. Students will need to bring money or a sack lunch/dinner as these are not provided. Schools are scored by judges on multiple aspects of their show and are compared to other bands of the same size. Awards are held at the conclusion of all competitions (students are expected to stay through awards). Students are expected to return to the school following the competition for unloading the truck. They are only allowed to leave once dismissed by the Band Director. Parents should make arrangements to have students picked up promptly after dismissal. What are the letters associated with the different competitions on our schedule? Scores obtained under each only count for that specific organization. Why do we compete under more than one organization in the same season? Our primary organization this year will be: SCSBOA. We compete in tournaments under the other organizations in order to have “practice” runs of the performance in a competitive setting as well as to support our local area schools (Murrieta). What happens at HOME football games? Students should report to the Band Room in full uniform at Call Time of 5:00 pm. Proper clothing must be worn under their uniform (see “Uniform” section for details). Students are advised to eat dinner prior to arriving at TVHS as they will not have the opportunity to eat until after the game. It is a tradition for students to go to dinner following the games (In-N-Out is their preferred restaurant). This is completely optional. NO EATING IS ALLOWED WHILE IN UNIFORM! Volunteers are always needed to help at the games with uniforms, hair, stadium preparation, and moving equipment to the football field. Band parents and friends and family are welcome to attend all games. Seating is usually in the rows above the band which is to the right of the “Gold Zone” student section (while looking at the field). Tickets are purchased at the gates at the front and back of the stadium. What do I need to know about uniforms? The uniform consists of: a jacket, pants, gloves, a shako (hat), and a plume. Students keep uniforms at home and uniforms should be hung and placed in garment bags when not being used. Students will need two pairs of gloves: one for football games and competitions and one pair for finals. Some students will need to cut the tips of the fingers, depending on the instrument they play. Black shoes (these are ordered through the Uniform Coordinator). The band has a small supply of loaner shoes, but they may be purchased if you would like your student to have their own pair to keep. White gloves (these are ordered through the Uniform Coordinator). Long hair needs to be in a ponytail or braid and neatly tucked into the shako. Hairnets work well for hair that is not long enough for a ponytail or braid. What are some frequently used terms I should know? Drill — This refers to the movement of the band members during the show. These are programs available to students after marching season. Any marching band student may join either program. Students do not have to be a part of percussion or guard during the fall to participate. These programs are funded separately from marching band. Direct donations are the main source of funding, and fundraising opportunities will be available for needed funds. The cost per student is similar to that of marching season (depends on the number of students participating). Music for concert season is practiced during class time. Occasional after-school practices may be required. Performances are usually during the week in the evenings. Students may travel to a competition or performance in the community during school hours. Transportation by bus will be provided. Practices, competitions, and performances are a requirement of the band course and attendance is reflected in the student’s grade. Any absences must be cleared in writing (email is preferred) through the Band Director prior to any event. Tuxedo pants and jackets are provided. Fittings will be done at the start of Spring Semester. Students are responsible for providing a white tuxedo shirt and black bow tie. Black dress shoes. No sneakers. Marching shoes may be worn. Black dress or black top and black skirt. No sleeveless or spaghetti straps. Dresses and skirts must fall below the knee when sitting. Black dress shoes (closed-toe, low heel). No sandals. How do band students earn a letter? 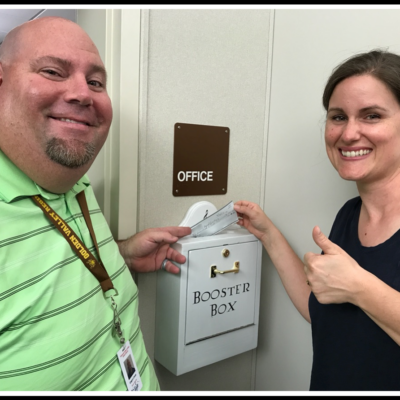 How can a donation be made to help the band program? The band program cannot function without funds provided through donations and fundraising. The program is a non-profit 501(c) organization, so all donations are tax deductible. At the beginning of the season, you’ll fill out a Student/Family Financial Pledge and be given several Donation/Payment Forms. In person with a credit card. 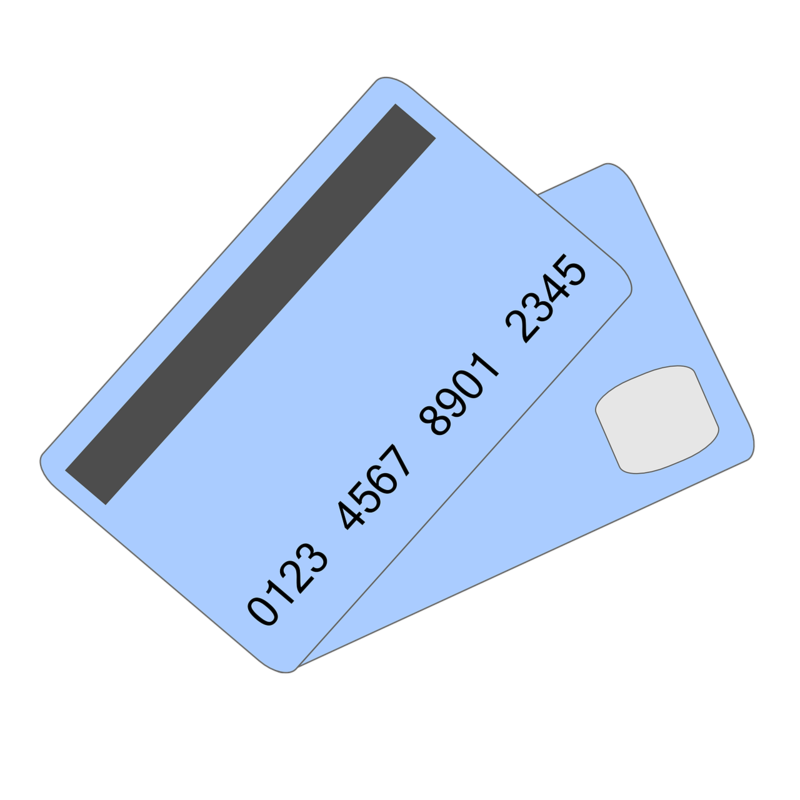 See our treasurer who has a mobile credit card terminal. What kind of fundraising opportunities will there be? We offer a number of fundraising opportunities throughout the year. Participation in fundraising is optional; however, attendance at fundraising activities is mandatory for students. Prizes and incentives may be offered to students for participating in fundraising, but will never be given based on specific amounts raised. They will print a check to the organization, which can be dropped in the Booster Box along with a Donation/Payment Form. Email — This is our primary mode of communication. We gather email addresses at the beginning of the year. You can also sign up right here. 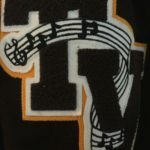 Website: www.tvhsband.com — As you can see, we have a lot of information right here along with calendars, forms, events, messages from the Band Director, and much more. Check frequently for changes. Facebook Private Group — We administer a closed Facebook group available to friends and family of current band students. We post messages regarding upcoming events and reminders for parents and students along with occasional photos and videos of performances. Upon graduation, members are removed from the private group and asked to “like” our public page. Facebook Public Page — We also have a public Facebook page (@TVHSGoldenValleyRegiment) intended for the general public. Encourage your friends, extended family, business associates, and anyone else interested in supporting the band to “like” this page. Volunteer! It’s a great way to meet other band parents — and we can always put you to work. We are always in need of new ideas of how to make our program even more successful. The Temecula Valley High School Band Boosters is a non-profit 501(c) organization that supports the efforts of the Golden Valley Regiment Marching Band and Color Guard at TVHS. We are a group of dedicated parent volunteers who offer our time and effort to help create a meaningful and memorable experience for the children in this program. Please help keep this program alive with a financial contribution. We encourage you to join us in supporting the band. Offset our PayPal transaction fee of 2.2% + $0.30 by adding $2.50 to every $100 donation. Every little bit helps. Thank you!